1. 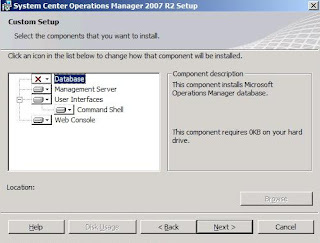 On the Custom Setup, select all component except Database component. 2. The wizard will perform pre-requisite check and make sure no fail. 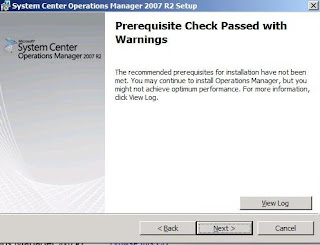 The wizard will not allow you to proceed if fail on the pre-requisite check. The figure below display warning due to i did not have 2048 MB RAM on the server. You still can proceed with the installation . 3. 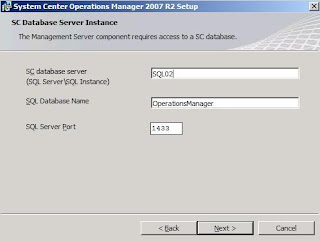 Enter SQL02 and OperationsManager database name. 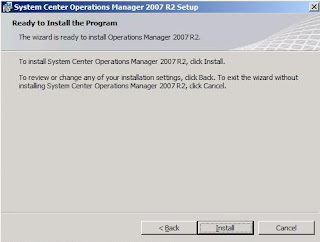 The wizard will try to connect to SQL Server to verify the operation database is exist. Make sure TCP/1433 port is open on the Firewall. 4. 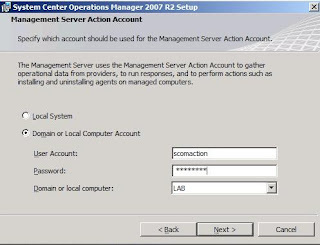 On the Management Server action account, enter the domain account scomAction which you have created in previous article. 5. 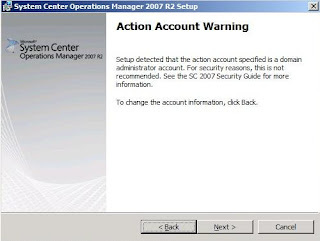 Action Account Warning appear due to account is assign with domain admin rights. Click Next to proceed. 6. 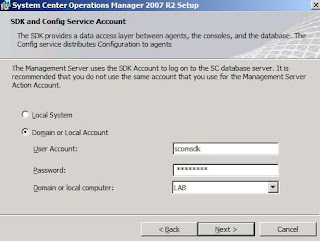 On the SDK and Config Service Account, enter the domain account SCOMSDK user account. 7. 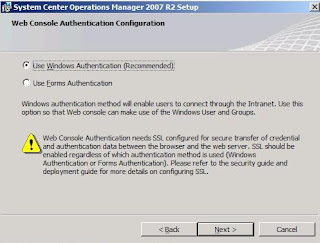 On the Web Console Authentication configuration, select Use Windows Authentication when we want to access web console from Intranet. Select Form Authentication if you want to access from the Internet. 8. 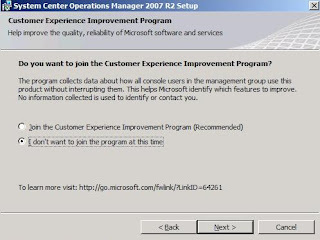 On the Customer experience improvement program, select "I don't want to join.."
10. Wait until the installation is complete.